When you first buy a mountain bike, you will notice the stock pedals work but not great. In other words, they do not allow you to get the most out of your riding. That’s why most mountain bike riders buy a performance-based pedal. This way you don’t worry about issues like your feet slipping off, mud build-up, and a poor power-take-off. 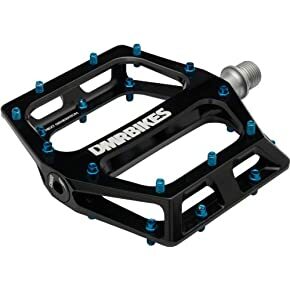 So, if you are in the market for new mountain bike pedals, then you just stumbled upon a convenient guide. That’s because there are some key components you should understand before buying a set. Starting the TYPE. When choosing between mountain bike pedals, you should know the different types. There are two types of pedals: flat and clipless. There is also a “combo” pedal that uses both types in one. Let’s discuss each. Also known as platform pedals, flat pedals are most popular for beginners and those who prefer shorter rides. The biggest plus when using flat pedals is you don’t need special shoes. Simply install them right out the box and go riding. Also, flat pedals make it much easier to take your foot off while riding. So, if you need to jump off your bike for any reason, your foot is not attached. And maybe best of all, they are typically lower in price. This makes it a favorite for beginner riders because it doesn’t require too large of an investment to get started. Clipless pedals are perfect for riders who have a bit more experience or for beginners who want to improve. It’s a three-part system between your shoes, cleats, and pedals. The top part of the cleat attaches to your mountain bike shoe and the bottom to the pedal. When you clip in, you become attached to the bike. Now you can achieve optimum performance from both pushing and pulling. And that’s one of the most significant benefits of a clipless pedal, that fact you can pull up too. Now you can achieve the most speed from your efforts. Clipless pedals also improve pedal efficiency because you and your pedals become one machine. That’s the recipe for ultimate power transfer. Another benefit is you will improve your handling while on technical trails. Since you are clipped your feet stay attached to the pedals even when the trails get bumpy. And as mountain bike riders, we know trails will get bumpy. They are also typically lighter and smaller in size. Lastly, combo pedals have been gaining more and more popularity within the industry. It’s a combination of a flat pedal and a clipless pedal. It’s the best of both worlds and perfect for beginners who want to use their bike for performance as well as short commutes. Now that you know the different types of mountain bike pedals, let’s discuss how to choose the best one for you. Once you know what type of pedal is best for you, there are other key components you should become familiar with. Keep reading for a description of each. We will discuss weight, adjustments, maintenance, mud shedding, and price. Weight – Different brand pedals come in different weight. What effects weight the most is the size and construct. Here’s the good news: the pedal weight is always listed in the product description. So, if having a lightweight pedal is important to you, be sure to compare it between all the pedals you browse through. Adjustments – If you decide to go with a clipless pedal, then there are two types of adjustments: tension and float. Pedal tension refers to the force applied to the cleat when clipping and unclipping. Pedal float refers to what degree you can move your foot when it’s clipped in. So take a look at the adjustment process and make sure it’s as painless as possible. Maintenance – Can you perform maintenance on your pedals? If so, how easy is the process? Make sure to have these two questions answered before buying a pair. Most pedals nowadays allow for maintenance and don’t take much effort to do so. Regardless, it’s still a good idea to check. If your pedal breaks or if your pins wear out, it’s good to know there’s a maintenance kit available in advance. You may even consider buying one along with the pedal. Mud Shedding – It’s common for mud to get stuck in your pedals. If you are an experienced rider than you know just how frustrating this can be. Fortunately, some companies design their pedals to prevent mud build-up. So, read up on the pedals mud shedding capabilities. Remember this–what it really comes down to is the spacing between each connecting part. 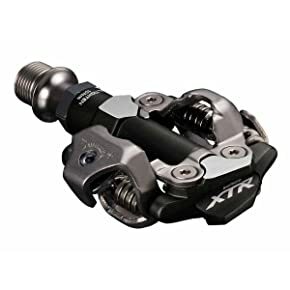 Price – Clipless pedals tend to cost more money. However, the lighter and more durable the pedal, the higher the cost. So, consider how much you ride and your budget, and make a decision that’s best for you. Now that you know how to choose the best mountain bike pedal for you, it’s time to pick one out. To make things easier, we reviewed the top 7 best mountain bike pedals in 2018. Continue reading for each review. The DMR Vault pedal reaches the number one spot not only because it’s top quality, but because it’s great for all riders. You will feel the grip from the moment your foot touches the pedal. It’s a flat pedal and its built super durable. Even when the pins eventually wear out, they can be easily replaced. 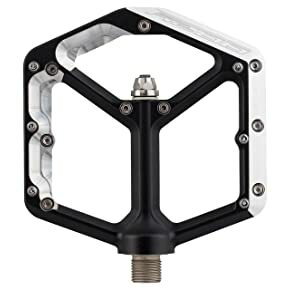 Made with extruded aluminum, steel axles, high load bushings, and cartridge bearings, this pedal becomes one of the most robust and lightweight on the market. Built for riding on steep terrain, it’s perfect for experienced riders, and since it’s a flat pedal, beginners will love it too. That’s because it doesn’t require any clipless shoes. Simply take them out the box, screw them on, and start riding right away. It’s that easy. Users of the pedals love them because of their excellent grip and large platform. Excellent grip for riding steep and challenging terrain. Large platform for a secure ride. Serviceable and a high quality build so they last longer. Super tough for the even the most extreme rides. Some riders experienced confusing when swapping out the pins. 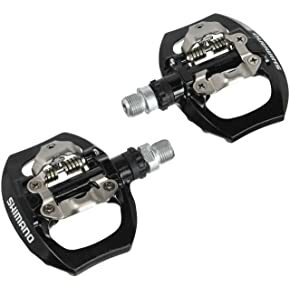 If you are looking for a clipless pedal that is both lightweight and durable and has an excellent power transfer, then this is the pedal for you. It’s called the ShimanonXTR M9000, and they are built for speed. Whether it’s their alloy body, thin profile, or mud-shedding design, this pedal provides superior performance. Simply put: more speed, long lasting, and perfect for shattering new personal bests. For those reasons, we believe this pedal is the best on the list for racing. One look at the thing and it screams “PERFORMANCE!”. It’s users praise it for being top quality. It’s a pedal they can rely on. Super lightweight for a faster and more comfortable ride. Easy to use, just clip in and go. Superior durability, this pedal is built to last. Excellent power transfer, a top choice for race day. Entry system and tension adjustments provide a nice and firm fit. Higher priced than other mountain bike pedals. The Crank Brothers Candy 7 clipless mountain bike pedal is described best in one word: functional. For starters, there’s a four-sided entry along with a two-sided platform. That’s in addition to its mud shedding capabilities, and it’s customization float angle. Add that to its superior ribs built into its integrated traction pad technology and your feet couldn’t fall off if you tried. Well, at least not as much as other pedals. All this functionality makes them easy to use. Ask any rider, and I’m sure they’d tell you how simple they are to step into. It’s a lightweight mountain bike pedal too. It’s aluminum body, and extra grip makes it perfect to use as a flat pedal as well. So, if you are a beginner and want to gradually move from a flat pedal to a clipless pedal than the Candy 7’s provide the platform to do so (no pun intended). Yes, it’s a little on the pricier side but as you can see–the value is there. It’s users love this pedal for its high-quality feel. 5-year warranty is a “you get your money’s worth” guarantee. Ribbed body for a superior ride when unclipped. Easy to clip in and out of for your convenience. Built to shed mud and prevent a build-up within the pedal, which means less cleaning and irritation. Company has had seal issues in the past. It’s essential for flat pedals to have extra grip when mountain bike riding. As we all know, trails can get bumpy, and the last thing we want is our feet jumping around uncontrollably. Well, with the Spank Oozy Trail Platform pedals you get a super grip. With 18 steel pins on each alloy pedal, it’s no wonder users say their feet feel secure when riding even on the most technical trails. Also, with their chambered edges and 12 mm profile, it becomes a perfect choice when rocky obstacles get in your way. Now you are much more comfortable riding more aggressively. This helps beginners and expert riders alike. It’s users praise these mountain bike pedals for their low profile and how easy it is to service them. Size and thin profile provide a safe and controlled ride so you can push yourself further as a mountain bike rider. Quick and easy servicing to help increase the pedals lifespan. 18 pins per wheel for extra grip while riding. Various color options, cool design. Some users have experienced issues with the bearings. The Shimano PD-A530 is best known for their two in one design. On one side you have a cleat pedal which is excellent for power-take-off and longer rides. But on the other hand, you get a flat pedal for convenient and shorter rides. So whether you are going on a long trip through the trails or a quick ride downtown, this mountain bike pedal has you covered. Besides their stellar versatility, they are built durable as well. Each pedal comes with steel spindles as well as a seal locked cartridge bearing to prevent premature wear. They are inexpensive too. So you can get this versatile and durable pedal for a great price. That’s why it’s our choice for the best bang for your buck. It’s users love the convenience of having the cleat pedal for long rides and the flat pedal for shorter ones. Low cost packed with a lot of value: clipless & flat pedal combination. Lightweight for a more comfortable ride and easier handling. Comes with cleats, so they are usable right out the box, it’s not a “no batteries included” product. Made by Shimano, one of the leading companies in the mountain biking industry. Platform side is less grippy than other types. Riders buy the Race Face Chester for two reasons. One, because you receive a high-quality flat pedal at a low price. And two, they are easy to service. So, although it’s a low-cost pedal, if you keep up with service intervals then they will last longer. Plus, its body is made from a nylon composite while the axle is made from steel. This allows them to provide a firm and robust ride. Its platform is on the smaller side, but its lightweight nature ranks among some of the more expensive mountain bike pedals. It’s grippy too. Some users have even said, “They stick like glue.” No, it’s not your top of the line, high-performance pedal, but it’s without a doubt an upgrade to what comes stocked. 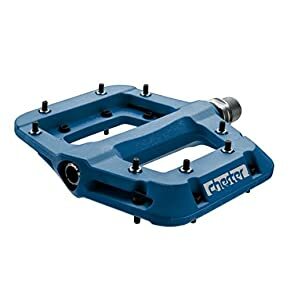 If you are looking for a low-cost flat mountain bike pedal to enhance your riding, then give this one a shot. You may be surprised at what a positive experience you have. Lightweight for a quick and comfortable ride. Super grippy for riding of technical terrain. Inexpensive relative to other pedals but provides excellent value. First things first, if you are a beginner mountain bike rider than this pedal is not for you. It’s much more involved and comes at a much higher price than other pedals. But if you are a serious mountain bike rider, or looking to begin your journey into racing, then check out the Time ATAC XC 8. It comes with a carbon body and a hollow steel pedal spindle which means lightweight and fast speeds. It’s also self-cleaning so as long as the cleat is connected to the pedal, you won’t have any mud or dirt build up. Plus, it’s really easy to step into because it’s built with a wider than average angle. It’s users praise this pedal for its durability and lightweight nature. Excellent mud shedding abilities so no more build-up. Extra play in your shoe while being clipped in for ease of making foot adjustments. Super durable construct for the most challenging rides. Lightweight and fast, great for racing. Now that you have read the top 7 best mountain bike pedal reviews you may still have a few questions remaining. But don’t worry, this is common. Especially when picking out a mountain bike pedal for the first time. So, keep reading for the most frequently asked questions about mountain bike pedals. Read on for the 5 most asked questions when it comes to choosing a mountain bike pedal. 1. How do clipless pedals attach to my feet? Most clipless pedals come with cleats included. The cleat attaches to your mountain bike shoes. So, yes, you will need a pair of mountain bike shoes if using clipless pedals. Once the shoe and cleat are attached, the cleat clips into the pedal and you can begin riding. 2. If you clip into a clipless pedal then why is it called “clipless”? Confusing, I know, this is a question for all mountain riding beginners. At one time, your feet manually “clipped” into pedals and became a permanent fixture. As you can imagine, this caused a lot of avoidable accidents if there was a way to detach on the go. 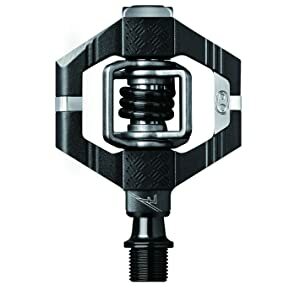 Today, with clipless pedals, your feet can connect in and out without manual adjustment, so they received the name “clipless” even though they technically still clip in. 3. 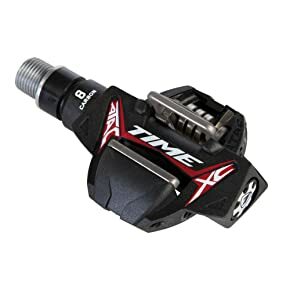 How long do mountain bike pedals last until new ones are needed? That depends on how much you ride and the quality of the pedal. But if you want your pedals to last longer then make sure they are serviceable. This way you can swap out parts like pins, bearings, and seals for a longer lifespan. 4. How do you install new bike pedals? Most mountain bike pedals screw on and off with a wrench. An adjustable wrench is usually good enough. Some pedals will come with a small wrench also. In most cases, the left pedal is reverse threaded, so you must turn it clockwise to remove it. The right side is typically standard so you can go by the principle “righty tighty lefty loosey.” But double check the instructions to be safe. 5. Will my feet slip off of flat pedals? Although clipless pedals will guarantee your feet to stay on the pedals, flat pedals do a great job too. That’s because they provide excellent grip. However, the pins dig deep into your shoes, so it’s a wise decision to use a flat mountain bike shoe also, although they are not required. The most significant benefit of clipless shoes is the power transfer. That’s because when you “pull up” you are providing a force in addition to pushing down. So there you have it, a mountain bike pedal guide to find the best one for YOU. Remember, we all ride different and perform at different levels. So, that’s why this guide doesn’t tell you precisely what pedal to buy. No, what it does is GUIDE you into finding the best pedal for YOU. But the key is to not second guess yourself. While reading the reviews, you most likely had a gut feeling. And as you may know, our first choice is usually the best choice. So, pick a pedal, get it delivered, and get ready to feel a HUGE difference in your riding. Becoming a better mountain bike rider could possibly be only one pedal away, well…I guess TWO pedals away. So, grab a set of pedals and get to riding! Mentd.com participates in the Amazon Affiliates program – If you make a purchase after clicking a link from MenTD.com to Amazon.com, we will receive a small percentage of the sale at no extra cost to you. Thank you for your continued support !